Here are 5 free software that let you download Picasa Web Albums on your computer. You can download all the photos in the Picasa album in the original resolution, and not thumbnail size. You can download Picasa albums of you or your friends. You do not need to provide your Picasa password to download Picasa web albums. Picasa is one of the most popular photo sharing site. Normally it is easy to upload photos to such photo sharing sites, but downloading photos can be a challenge. Recently we wrote about free software to download Facebook albums. So, we thought of doing the same about Picasa Web albums too. So, here is a nice list of 5 Free software to download all your Picasa web albums. Of course, the best option is to download Picasa on your computer, but in case you don’t have Picasa, these software will download Picasa albums for your. 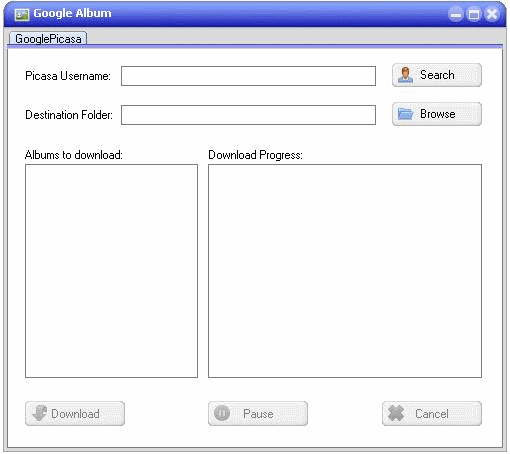 Google Picasa Album Downloader is a simple free software to download Picasa Web albums. It has a very basic interface. You just need to provide username of the person whose Picasa photos you want to download. Google Picasa Album Downloader will then show you all the public albums of that person. You can select the albums that you want to download, and just click Download button. It will immediately start downloading the selected albums. Update (28-Aug-2012): This downloader has been removed from Sourceforge. You can use one of the downloaders mentioned below. Google Picasa Album Downloader is extremely simple to use. It has no flashy features. It is designed for only one purpose: to download Picasa web albums. And it does that task very well. Try Google Picasa Album Downloader. 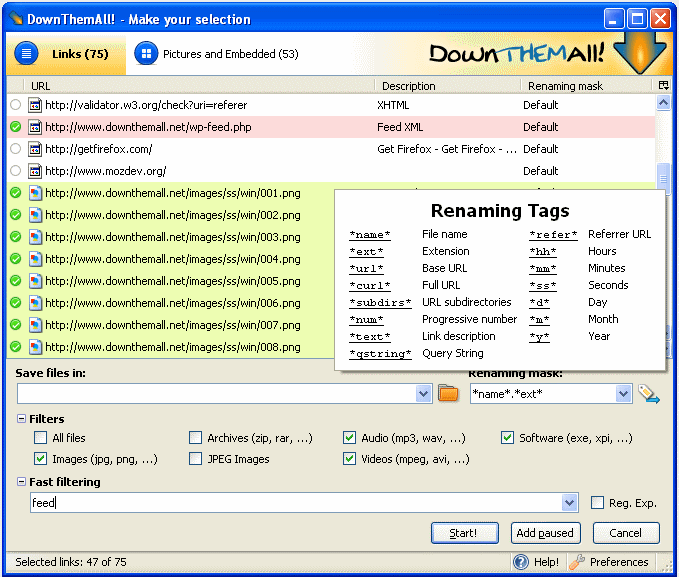 DownThemAll is a popular add on for Firefox that lets you download all sort of files from web from Firefox. One of the great feature of DownThemAll is that it also lets you download entire Picasa web albums. To download Picasa album using DownThemAll, just navigate to the album in your Firefox, right click on the page, and select DownThemAll. 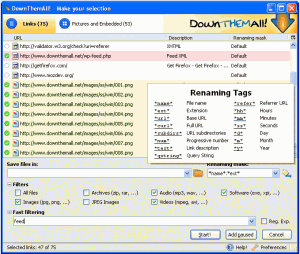 After that, go to Links tab of DownThemAll, and select filter for images. Just click on Start, and all the photos in the Picasa web album will be downloaded to your computer. DownThemAll works in all OS wherever you can install Firefox. Of course, only limitation is that you need to have Firefox, and you need to navigate to each album and download albums one by one. That of course is still much better than downloading photos one by one. Try DownThemAll [via GOS]. 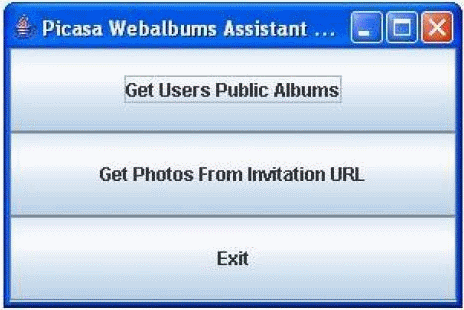 Picasa WebAlbums Assistant is another easy to use free software to download Picasa web albums. One great advantage that Picasa WebAlbums Assistant offer is that you can even download those Picasa albums for which you have invitation link, even if the albums are not public. Picasa WebAlbums Assistant works on any computer that has Java installed. When you start this program, it comes with a simple interface in which you can choose to provide username of the Picasa user, or invitation link of the Picasa album. After that, Picasa WebAlbums Assistant will show you the photos in your selected album. Another great feature of this freeware is that you can choose to download only your selected photos, instead of all the photos. Picasa WebAlbums Assistant is extremely easy to use to download Picasa web albums. Try Picasa WebAlbums Assistant. Picasa Album Downloader works a lot like Google Picasa Album Downloader. You provide username, and select the albums that you want to download. It comes in both English as well as Russian interface. Try Picasa Album Downloader. Pycasa is unarguably the most full featured program of all the Picasa downloaders mentioned above. Pycasa lets you download Picasa web albums by providing username, or link of album. You can even login to your Picasa account in Pycasa, and download your Picasa albums. Apart from downloading your Picasa web albums, you can even add photos to Picasa, edit your photos, and edit tags. Despite being so full featured, the reason I have listed it at the end is because it needs some additional software to work if you want to run it in Windows. You need Python, PyGTK, and GTK+Runtime. This page has links to these software for Windows. Try Pycasa. Also Read: Picasa Facebook Uploader.